Kick-off Beat the Bitter with the coldest and most challenging feat of the week, a polar jump into Centennial Park Pond (on St. Andrews Drive) on Sunday, Jan. 27, at 2 p.m. The plunge will take place during the Wintry Warm UP festivities. Organized by the North Liberty Police Department, the Freezin’ for a Reason Polar Jump will raise funds to provide support and training for the NLPD’s K-9, Falco. 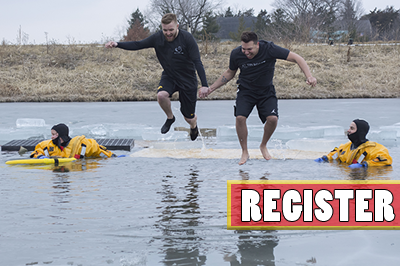 Falco will also be onsite during the polar jump for a demonstration before the jump with Officer Campbell at 1:30 p.m.
Register online through the link below or day of the jump at Centennial Park with a $50 donation to take the plunge. Spectators are also welcome to cheer jumpers on! A heated tent and certified divers will be on-site for jumpers’ safety.